I went to my first LA Scotch Club event last night: Scotch and Crepes at Jack 'n Jill's Too in Beverly Hills. We kibbitzed, noshed, and drank, and not necessarily in that order. I continued my renewed love affair with Nutella (via the dessert crepe), confirmed that Willet is bottling some awesome rye, and tried to make my pursuit of a screenwriting career sound sensible. We samples six whiskys, but due to all of the socializing, no full reports were completed. So these will be brief thoughts (read: ramblings). Highland Park 12 - Two years ago the peat level on this was too much for me. Now it's mild as a breeze. 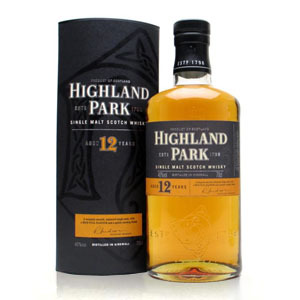 Highland Park whiskys are known to have a great balance of many malt characteristics: peat, sweet, vanilla, grasses, dried fruit, etc. This one seemed a bit shy to me. I still like all of its angles, but it was a little on the sleepy side. Balvenie Doublewood (previously reviewed in my very first report!) - A sweetie compared to the HP12. Very morish. Honeyed and smooth, though we picked up a bit of bitter black pepper in the finish that I'd never noticed before. Otherwise, easy quaffin'. Glenfiddich 15yr Solera Reserve - I'll admit this was a part of a scouting mission. I was on the lookout for my next reasonably priced go-to single malt. 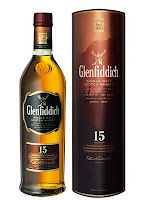 The 'Fiddich 15 was a candidate, but I'd actually never tried it before. And while it's totally inoffensive, and has a nice thickness and sherry sweetness that the 12 is missing, I will bypass purchasing this bottle for now. I'm looking for something better than inoffensive for my dollar. Ardmore Traditional Cask - I hadn't had an Ardmore in five or six years, so I was looking forward to this one. This bottling includes some quarter cask whisky which has been can't-miss for me so far. It turned out to be the peatiest (but agreeably so) of the six and packed a good punch at 46% ABV. A couple of the guys at the table noted its "sharpness", which I caught too. Possibly due to young malt. It's not an easy one, but still decent for peat and strong oak fans. Laphroaig 10yr (previously reviewed here) - This one keeps getting better every time I try it. It was sweeter than I'd remembered it. A lot of nice cinnamon too. The 40% ABV keeps it mild and almost refreshing. Wow, I've done a complete 180 on this one. Tamdhu 10yr - This was an unannounced surprise malt. It was okay, kinda forgettable, but then again I forget stuff all the time. It's a major element within Famous Grouse and Cutty Sark. In fact, I might have thought it was a Sark-like blend had I been blindfolded at the tasting. Edrington mothballed the distillery (wisely?) three years ago, then it was bought up by Ian MacLeod Distillers who may be reopening it in a year or so. Good luck to MacLeod, who did some good work after they bought Glengoyne. So, Laphroaig wins the day, with Ardmore's Trad Cask following close behind. The peaters! Many thanks to the LA Scotch Club for the good dinner and scotchin'! If you want the flavors of the 'Fiddich 15 but with more heft, keep an eye out for their Distillery Edition. It's bottled at 102-proof and has power to spare. Thanks! I'm looking forward to that one. 'Fiddichs can always use some extra heat. Glendronach was also known for being a forgettable whisky when the distillery was mothballed in 1996. Seeing as that distillery is blossoming under new owners, here's hoping for great things to come from Tamdhu in the future. Yeah, I like the whiskys coming from Ian Macleod quite a bit so I've got some hope. Though they'd intended to reopen Tamdhu this year, it looks like it's still mothballed. You're right, Glendronach has demonstrated that with the right folks managing the distillation and maturation, a distillery's whisky can be transformed. 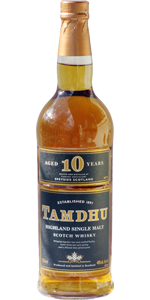 The new Tamdhu 10 is all ex-sherry casks which makes the old bottling (with more ex-bourbon maturation) a bit of a rarity. Of course I also found the old bottle to be a bit forgettable so upping the sherry content might make it more interesting. The new Coke bottle design is also pretty cool. Wonder when it's coming back to the US? I wonder that too. MacLeod's new Glengoyne range has been slow to get to the US (if it's gotten here at all). I'm rooting for Tamdhu to succeed but some of the new pricing has been silly.